The decision of the Chipotle restaurant chain to make its product lines GMO-free is not most people's idea of a world-historic event. Especially since Chipotle, by US standards, is not a huge operation. A clear sign that the move is significant, however, is that Chipotle's decision was met with a tidal-wave of establishment media abuse. Chipotle has been called irresponsible, anti-science, irrational, and much more by the Washington Post, Time Magazine, the Chicago Tribune, the LA Times, and many others. A business deciding to give consumers what they want was surely never so contentious. From this perspective, the significance of the Chipotle move becomes clear. If Chipotle can gain market share and prestige, or charge higher prices, from selling non-GMO products and give (especially young) consumers what they want, it puts traditional vendors of fast and processed food products in an invidious position. Kraft and McDonald's, and their traditional rivals can hardly be left on the sidelines selling outmoded products to a shrinking market. They will not last long. MacDonald's already appears to be in trouble, and it too sees the solution as moving to more up-market and healthier products. For these much bigger players, a race to match Chipotle and get GMOs out of their product lines, is a strong possibility. That may not be so easy, in the short term, but for agribusiness titans who have backed GMOs, like Monsanto, Dupont, Bayer and Syngenta; a race to be GMO-free is the ultimate nightmare scenario. "We sell organic products...gluten-free products and...natural products. [But] where the big, big demand is, is GMO-free." The causes of the problem, however, lie in the technology itself. The introduction of Roundup-resistant traits in corn and soybeans led to increasing Roundup use by farmers (Benbrook 2012). Increasing Roundup use led to weed resistance, which led to further Roundup use, as farmers increased applications and dosages. This translated into escalated ecological damage and increasing residue levels in food. Roundup is now found in GMO soybeans intended for food use at levels that even Monsanto used to call "extreme" (Bøhn et al. 2014). The two new herbicide-resistance traits are set to recapitulate this same story of increasing agrochemical use. But they will also amplify it significantly. The second issue is that the combined spraying of 2,4-D and Dicamba and Roundup, will only temporarily ease the weed resistance issues faced by farmers. In the medium and longer terms, they will compound the problems. That is because new herbicide-resistant weeds will surely evolve. In fact, Dicamba-resistant and 2,4-D-resistant weeds already exist. Their spread, and the evolution of new ones, can be guaranteed (Mortensen et al 2012). This will bring greater profits for herbicide manufacturers, but it will also bring greater PR problems for GMOs and the food industry. 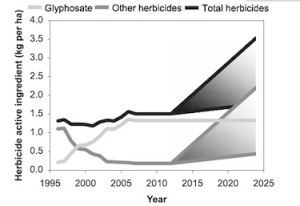 GMO soybeans and corn will likely soon have "extreme levels" of at least three different herbicides, all of them with dubious safety records (Schinasi and Leon 2014). The first time round, Monsanto and Syngenta's PR snow-jobs successfully obscured this, not just from the general public, but even within agronomy. But it is unlikely they will be able to do so a second time. 2,4-D and Dicamba-resistant GMOs are thus a PR disaster waiting to happen. The most revolutionary and innovative part of that pipeline is a technology and not a trait. Many products in the GMO pipeline are made using RNA interference technologies that rely on double-stranded RNAs (dsRNAs). dsRNA is a technology with two problems. One is that products made with it (such as the "Arctic" Apple, the "Innate" Potato, and Monsanto's "Vistive Gold" Soybeans) are unproven in the field. Like its vanguard, a Brazilian virus-resistant bean, they may never work under actual farming conditions. The conclusion therefore, is that dsRNAs that are apparently indistinguishable from those produced in, for example, the Arctic apple and Monsanto's Vistive Gold Soybean, have strong negative effects on vertebrate animals (but not plants). These vertebrate effects are found even at low doses. Consumers are vertebrate animals. They may not appreciate the thought that their healthy fats and forever apples also contain proven toxins. And on a business front, consumer brands will not relish defending dsRNA technology once they understand the reality. They may not wish to find themselves defending the indefensible. The last pipeline problem stems from the first two. The agbiotech industry has long held out the prospect of "consumer benefits" from GMOs. Consumer benefits (in the case of food) are most likely to be health benefits (improved nutrition, altered fat composition, etc.). The problem is that the demographic of health-conscious consumers no doubt overlaps significantly with the demographic of those most wary of GMOs. Show a consumer a "healthy GMO" and they are likely to show you an oxymoron. The health market in the US for customers willing to pay more for a GMO has probably evaporated in the last few years as GMOs have become a hot public issue. The traditional chemical industry approach to such a problem is a familiar repertoire of intimidation and public relations. Fifty years ago, the chemical industry outwitted and out-manoeuvered environmentalists after the death of Rachel Carson (see the books Toxic Sludge is Good for You and Trust Us We're Experts). But that was before email, open access scientific publication, and the internet. Monsanto and its allies have steadily lost ground in a world of peer-to-peer communication. 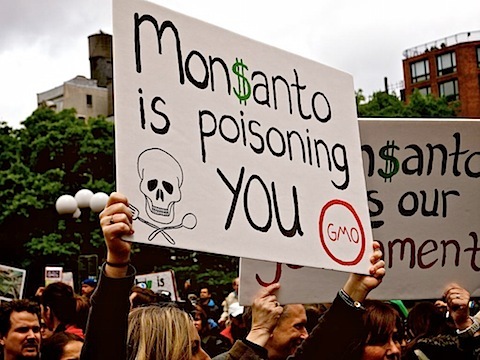 GMOs have become a liability, despite their best efforts. Pro-GMO advocates and paid-for journalists, presumably financed by the life-science industry, sometimes fronted by non-profits such as the Bill and Melinda Gates Foundation, are being given acres of prominent space to make their case. Liberal media outlets such as the New York Times, the National Geographic, The New Yorker, Grist magazine, the Observer newspaper, and any others who will have them (which is most) have been deployed to spread its memes. Cornell University has meanwhile received a $5.6 million grant by the Gates Foundation to "depolarize" negative GMO publicity. But so far there is little sign that the growth of anti-GMO sentiment in Monsanto's home (US) market can be halted. 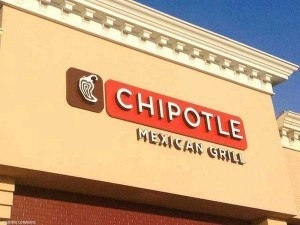 The decision by Chipotle is certainly not an indication of faith that it can. GMO roll-outs in other countries have relied on three things: the deep pockets of agribusinesses based in the United States, their political connections, and the notion that GMOs represent "progress". If those three disappear in the United States, the power to force open foreign markets will disappear too. The GMO era might suddenly be over. Bøhn, T., Cuhra, M., Traavik, T., Sanden, M., Fagan, J. and Primicerio, R. 2014. Compositional differences in soybeans on the market: Glyphosate accumulates in Roundup Ready GM soybeans . Food Chemistry 153: 207-215. Karpala A.J., Doran T.J., and Bean A.G.D. (2005) Immune responses to dsRNA: Implications for gene silencing technologies . Immunology and cell biology 83: 211–216. Schinasi L and Maria E. Leon ME (2014) Non-Hodgkin Lymphoma and Occupational Exposure to Agricultural Pesticide Chemical Groups and Active Ingredients: A Systematic Review and Meta-Analysis . Int. J. Environ. Res. Public Health 11: 4449-4527. This page contains a single entry by sal published on May 21, 2015 12:52 PM. Alarming rise in number of reported whooping cough cases was the previous entry in this blog. Editor In Chief Of World’s Best Known Medical Journal: Half Of All The Literature Is False is the next entry in this blog.